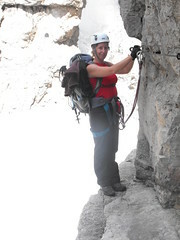 Trip to the Brenta Dolomites to discover more Via Ferrata with Annette. Set off from Derby at 6pm, arrive in Dover at 10pm. Stay in the Swingate Inn, have a couple of beers in the very nice garden. Small basic room. Awake to the hotel alarm ! Get up at 7:40am, Annette showers. Have a nice full English breakfast. Leave hotel and get to the port at 9:15am, departure delayed till 11:15. Board the "Pride of Canterbury", very smooth crossing. 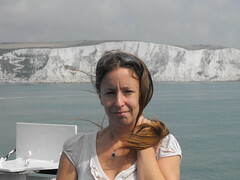 Good views of the White cliffs all the way across. Arrive in Calais at 13:30, clear day, good drive along L'Autoroute Des Anglais. Robert Taylor and Rachael make it up Scarfell in 3½ hours. Drive on to Strasbourg and stop at Colmar. Lots of parked cars makes me think that something is going on. Try three hotels, all are full. The woman at the Novotel happens to mention that there is a wine festival on. Decide to drive on to Sausheim, stay in a nice Ibis. We both have faux fillet with fantastic pasta parcels. Busy breakfast time, away by 10:30am. 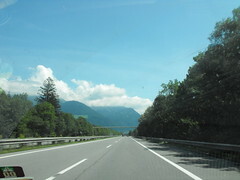 Drive to Basel and cross into Switzerland, pay 30 Euro to drive on their motorways. Drive along to Zurich, lots of tunnels. Up to Vadez, not much different, on into Austria. Stop before Innsbruck for sandwiches. Up and over the Brenner pass and down to Bolzano. Stop near Bolzano, very hot. Drive on the now familiar Brennero to Modera autostrada. 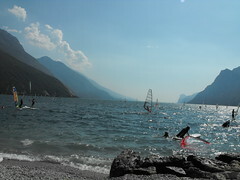 Head to a campsite at Molveno, when we get there it is rammed. Drive up a mountain track by mistake for a while before we are forced to turn around. Drive on to the Rendena valley, find a good camp site. Annette sets up the cooker and everything. Have pizza and wine. Heavy rain and thunderstorm starts at 4am and lasts till about 6am. Still raining when we get up. Decide to drive to Trento to explore the area. Wander round and eventually find the Tourist Information, not very helpful. Find a Gelateria, Annette has a Macedonia di Frutta. Drive back, have a drink at Bar Studel, above Sarche. 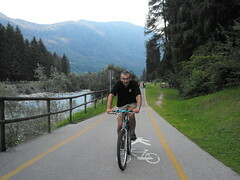 In the afternoon we cycle up the valley, very easy coming back down. Drive up to Pinzola in the evening to eat, Italian meats to start, Annette has a Stinco, I have Goulash. Scrambled egg and beans for breakfast. 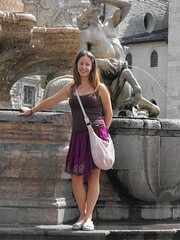 Decide to drive down to Lake Garda, go thought Sarche and Riva. Stop at Limone and I go for a swim. Drive on down the west side, under the road tunnels used to film Quantum of Solace. 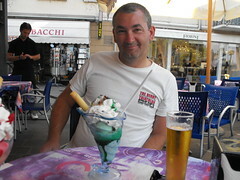 Stop in Desenzano, very posh, have an ice cream. Drive back up the east side of the lake. Get back at 9:15pm. The camp shop is still open so we buy charcoal. Drag over a large steel BBQ, have kebabs, sausages and spatzle. Still tired, read the VF book. Attempt to get in the swimming pool twice, the first time it is closed, the second time we have no swimming caps. Get the man at the campsite to book 3 Refugio's in the mountains. Start to cycle at 6pm, head up the valley, very nice. Lots of people are cycling. Turn round at Pinzola, and fly back in 15 minutes. Decide to eat in the campsite restaurant again. I order tortellini and some wholewheat stuff turns up. Annette up at 7:10am, when the man with the chain saw starts work. Pack up and away by 10am. Drive to Madonna di Campiglio. Wander round and buy an ice axe, some instep crampons and a red cagoule. Go up the Groste lift, start walking at 12:15, very hot and I am short of breath. Put the VF gear on at about 3pm. Fairly easy VF but lots of exposure. Starts to get misty so we miss out the last part of the walk and come down route 315 to Rifugio Tuckett, arrive at about 7pm. Have a rather rushed evening meal since the kitchen shuts at 7:30pm. Bar closes at 10pm so we all have to go to bad. The beds are in great need a some oil and squeak loudly with the slightest movement. Awake at 7am, breakfast of dry bread at 7:30. Start walking at 9am, we are doing Brenta 2, Sentiero SOSAT. We seem to go a long way up the valley and still be in sight of the Rifugio. Cross a large bolder field. 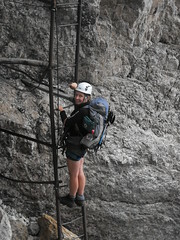 Start descending a series of ladders into a deep gully. One group push past us at one stage. The way out of the gully is a 20m, 51 rung vertical ladder, quite hard work on the arms with the load that we are carrying. 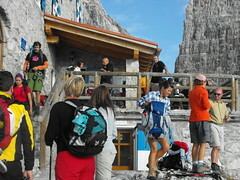 Walk up to Rifugio Alimonta (2580m), arrive at 3:30pm. Good views of the glacier that starts Brenta 5. Very modern hostel, share a room with a German couple. I have a stone cold shower. Dinner is well organised, every one eats together. Annette has Canderli in broth followed by mixed grill. I have spaghetti ragu followed by Goulash and Canderli. We get talking to a group on our table, three Italians and one Spaniard. We join in with their card game. It is a bit difficult because they have no 8, 9 or 10 and play anti-clockwise ! We teach them now to play speed cards later. In bed and lights out by 10pm. Annette does not sleep well again. Have some debate about what to do today. Have early breakfast, 7:30am and hang around until 9am to start the walk over the glacier to Brenta 5, Via Della Bocchette Centrali. Use the crampons to good effect. Classic Brenta VF, lots of ladders and ledges. See lots of climbers on the Campanile Basso. Arrive at Rifugio Pedrotti (2491m) at about 3:30pm. 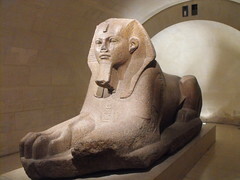 The book has 3½ hours for this route. Have a long rest sitting outside the Rifugio. The restaurant has a unique and inefficient way of serving food. Sleep on the third floor. Lots of people in our Dorm get up at 6am, so we get up at 7am. Have the usual breakfast and start walking down at 8:30am. I was a little confused about the directions to go to start with, but the signs set us straight. Cross the Bocca di Brenta again and put on the crampons to go down the glacier. Talk to some Germans who had climbed Campanile Basso yesterday. 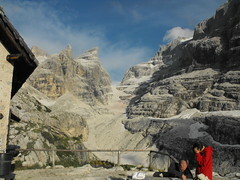 Have a beer and a rest at Rifugio Brentei. Another two hours down a very nice path and to Rifugio Casinei. Try to order food but give up. Walk down to Vallesinsella, arrive at 2pm, book on the bus for 4pm. After a bit of delay order food there. Get back to the car, drive up to the top of the pass. We can see most of the Bocca from the road. Drive to Tione for food, but dead, so back to Pinzola. Watch Usine Bolt do 9.58, back to the campsite. Drive to Lake Tenno for the day, have a little swim. BBQ in the evening. Plan to go cycling from Vezzano, pack the bikes in the car, etc. 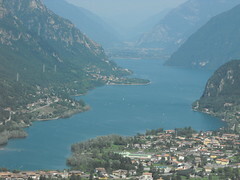 When we get there it is just too hot, about 38 degs C. Drive down towards Garda. Stop at Torbole and I have a bit of a swim. Have some spaghetti. Drive back over up the Ledro pass to Storo and back. Pack everything and depart by noon. The campsite man tells us that the hot weather is causing people to leave the campsite and go home. It is 38 today, they show us pictures of the campsite under four feet of snow. They give us a bottle of Grappa as we leave. Drive past Lake Idro, fantastic views. The sat nav sends us on a very strange detour through the hillls via Eno and Vobarno. I think it is a cool name but mispronounce it as Volbrano. 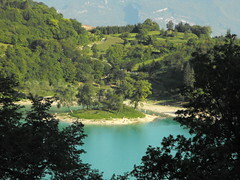 Head down to Bresia and along the motorway past Milan and up the Aosta valley. I was expecting to pass Bardonecchia and Sauze, but I have driven up the wrong valley. Queue to go under Monte Bianco, good views of the glaciers. Chamonix is very busy, try a couple of places and then continue west. Stay at an Ibis in Boug en Brasse. Sail on time at 9pm. Buy 18 bottles of duty free wine as soon as we get on board. Have chicken tikka for tea. 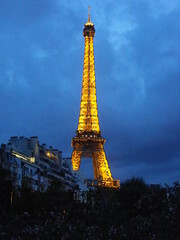 Land at 9:30pm UK time, very short of diesel. I drive up, Annette mostly sleeps, home for just gone 1am. Sleep well.